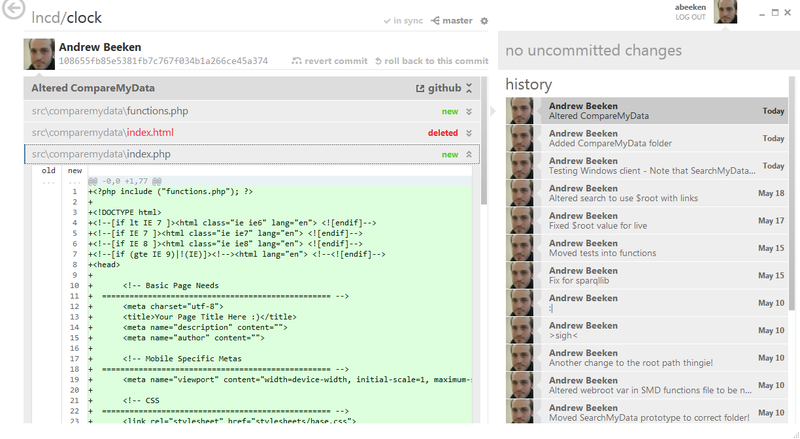 GitHub for Windows is AWESOME! Okay, so I’m a web developer first and foremost (it’s what pays the bills) and recently I’ve been getting a bit into version control. I tend to use Subversion and GitHub for repositories in work, with GitHub providing my personal repository. Basically I use my paid GitHub account as an emergency backup for all my WordPress client work, you know, just in case! For anyone who doesn’t know, GitHub provides online storage for programming type work that you can write changes to once they’re made. You can do other stuff as well but it’s basic use is as a backup tool. How do you get your stuff up there? Well, you have to use a client called Git which sits on your computer and allows you to commit and push changes to the online repository. Git is a bit of a fussy tool for people like me who work happily in a Windows environment, as it primarily provides a command line interface (called Git Bash). Don’t get me wrong, I know I should be able to type stuff in to command lines but, well, I’m lazy. So there. I’d much prefer to be clicking buttons. There is a visual interface, Git Gui, but it feels a little archaic and clunky. I took to mixing Git Bash with Git Gui to manage my personal repository. But now, along comes GitHub for Windows, and what a revelation it is! It provides a REALLY easy to use, clean, Metro inspired interface which simplifies the process of setting up and syncing repos. All you do is put in your GitHub login details. No more setting up SSL keys, it does this for you. No need to remember SSL passwords when committing – it does this too. It will let you clone repos at the touch of a button; you can import existing local repos by dragging and dropping and it will watch all files, alerting you when something needs committing! It’s THAT easy! I’m sure that some will scoff but, well, why isn’t everything this easy? Something like this makes what can be quite a daunting part of development very accessible to “noob” users. Here’s that link again – give it a try!